I skied the trail from Menomonie to Irvington this morning. It was a beautiful day but a little on the warm side. They were finally able to get the trail groomed from Menomonie to Irvington and beyond and it is very good for skate skiing. It was starting to get a little soft with the warm weather. Unfortunately they only have a single track starting in Menomonie down to just North of the 1 mile marker. They had a problem with the snowmobile and were not able to track the rest of the trail. There are some skied in tracks along most of this section of the trail but they aren’t the best. It was too warm for frost along the trail. The Ice wall at the 1.5 mile mark is still good and I saw a few ducks and Black-capped Chickadees along the trail this morning. You probably have a couple of days to enjoy the trail before the next storm hits. Of course I have a variety of birds that show up each year at my birdfeeder but I also have other critters that turn-up periodically. The one I would just as soon not see are the bears that come around every few years. 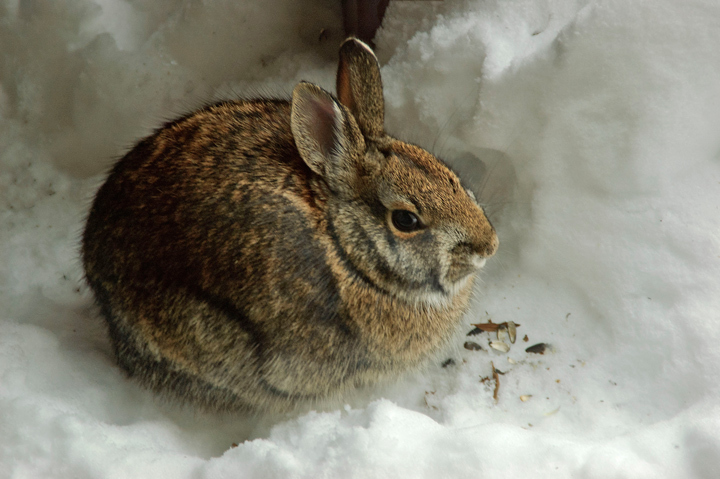 They usually turn up in the spring just after emerging from hibernation. Unfortunately I don’t have any shots of him but I have watched him sit out under the birdfeeder and tip up the feeder and drain the seeds into his mouth. 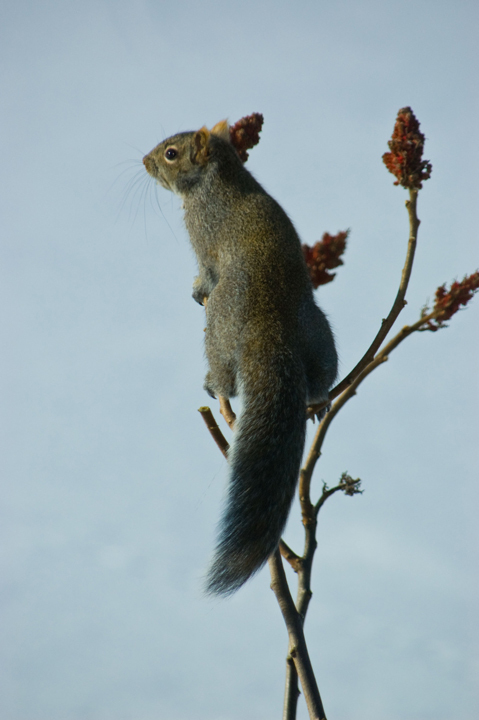 My birdfeeders are probably fifty yards from the nearest trees so I don’t have squirrels very often but they do show up occasionally. I watched this one for several hours trying to figure out how to get to my feeder. He eventually succeeded so I had to remove some pine branches I had placed at the base of the feeder for shelter for the birds. Once I did that he didn’t come around again. Hoppy the rabbit usually turns up in the evening after dark but this shot was taken one day when he spent the day under a porch near the feeder. 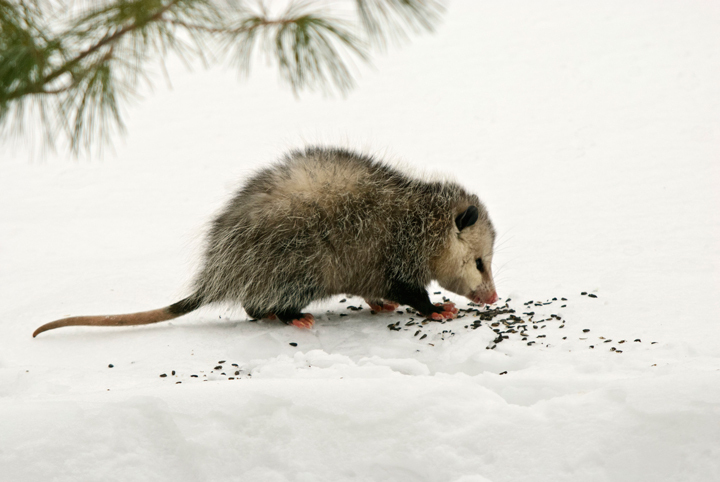 Another common visitor is pinky the opossum who usually turns up on warmer days and spends several house eating seeds around the feeder before heading off to the woods for the evening. If things work out well and I forget to shut the garage door he will come into the garage. One time he got into a house I made so one of the cats could sleep outside in the garage. It was quite a project to get him out of the cat house and then out of the garage. I’m frequently asked what kind of photography equipment do I have. First, it is important to note that the equipment does not make the photographer. My wife has taken some great photos with her little digital camera. Second, I have more equipment than I intended when I started down this road. Over the years I have developed a wide range of photographic interests which requires more specialized equipment. Secondly, I seem to be a little accident prone and have had to replace some equipment. When I retired six years ago from the University of Wisconsin-Stout I knew I wanted to spend lots of time outside. As a kid I spent almost every day in the summer and fall down at the local creek fishing, looking for turtles, looking for frogs etc. In later years I traveled all around the western United States and the world with a film camera. When I retired I didn’t want to spend money developing film and I also wanted more immediate feedback regarding the photos I was taking and the techniques I was using. Switching to digital cameras met both of those needs. The first decision I had to make was what brand of camera to use. I was impressed by Canon and seriously considered the brand. However, I had been using a Nikon film camera for years and had a couple of lenses for the Nikon SRL camera so I decided to stick with Nikon. The first camera I purchased was a Nikon D70s. This lasted for a number of years until one day I had an accident. I had made my first trip to Willow Falls State Park in the winter. The ice on the falls was fantastic and I got so excited that I turned the wrong screw on my tripod head and instead of loosening the screw that allowed me to rotate the head I loosened the screw that held the camera to the head. When I picked up the tripod I saw the camera slowly falling off of the head. It landed in the water with the lens up. I grabbed it but it was clear there was water damage. What to do. I wasn’t sure I could get the camera repaired so I ordered a new Nikon D80. After thinking about it for a while I sent the camera into Nikon to see what it would cost to repair it. Turns out it wasn’t as much as I thought so I had it repaired. Now I had two cameras. I found that having two cameras made it much easier. When I went out to photograph I could put the two lenses I was most likely to use for the day on different cameras. That way it could just swap cameras and didn’t have to change lenses in the field. Early on I found that changing lenses in the field under adverse conditions resulted in dust getting on the sensor. They can be cleaned but it is a pain. This approach worked well until disaster struck again. Last summer I was photographing and set the tripod down with the camera on it. The wind came up and blew a large branch into the camera and the whole thing fell over into a stream with a sandy bottom. What a mess. I tried to clean off the camera, lens and head but the camera and lens were toast. What to do. I wasn’t sure I could get the camera repaired so I ordered a new Nikon D300s. After thinking about it for a while I sent the camera into Nikon to see what it would cost to repair it. Turns out it wasn’t as much as I thought so I had it repaired. Now I had three cameras. Sound familiar? It is entirely possible that subconsciously I am dropping my equipment in the water so I have an excuse to purchase something new. Now I have three camera and find that I continue to use all three. I generally keep a different lens on each camera. When I want to shoot I usually have the lens I need already mounted so I just grab the camera and head out. This is what I do around the house. Sometimes when I’m photographing from the car I will also carry all three cameras with different lenses mounted. Normally when I’m hiking I only carry two cameras with the lenses that I think I will be using that day. The big advantage of the D300s is that it allows me to shoot at a much higher ISO than I could with the D70s and D80. When I purchased my original digital camera I also purchased aTamron 28-200mm lens and a Tamron 11-18mm lens. At the time I was primarily interested in landscape photography and I thought these two lens would cover the range of what I needed. They worked well but I found myself going back to an old Tamron 28-300mm lens that I had purchased with my film camera. I had originally purchased this lens because of its wide range and the fact that it was light. At the time I was hiking 15-20 miles per day and did not want to carry any more weight than was necessary. Currently I typically carry the latest version of the Tamron 28-300mm and the Tamron 11-18mm lenses when I’m doing landscape photography. A couple of years after retiring I was sitting in the house watching the birds at my feeder and thinking it would be fun to photograph them. I found I couldn’t really get great pictures with the Tamron 28-300mm lens from my living room windows but discovered that if I went down to my basement I was able to shoot the birds when they came near the house to perch on a lilac bush. I started looking for a lens that would give me more range and finally decided that a Tamron 200-500mm lens would give me a lot more reach. As a side benefit it was also relatively light so I could either pack it or carry it mounted on a camera mounted on my tripod. This has been my main birding lens over the years. I also frequently use it when I’m photographing flowers and butterflies. More recently I purchased a Nikon 500mm prime lens and a 1.4 teleconverter for use in my bird photography. I’m not a large person and this is one heavy lens. I can only use it with a tripod or it I have a rest of some kind. At this point I use it to photography birds around the farm and when I go to birding locations where I don’t have to hike great distances. When I’m hiking and doing bird photography I typically carry two cameras, one with the 28-300mm lens and one with the 200-500mm lens. If I’m shooting from the car I add the 500mm lens to the mix. As I wandered around my farm taking pictures I noticed an increasing number of photos that would have been better had I had a macro lens. A couple of years ago I invested in a Sigma 150mm f-2 macro lens and a set of Kenko extension tubes (36mm,20mm and 12mm). If I’m out shooting flowers I typically take my 150mm macro lens, extension tubes and the 28-300mm lens. I normally use a UV filter mounted on my lenses as a precaution since I’m so accident prone. I also carry a Circular-Polarizing filter for my landscape and macro lenses. In addition I carry a two stop and a 3 stop Neutral Density filter for my landscape lenses. I use the neutral density filters to allow me to reduce the shutter speed to for waterfall shots. It is very helpful on sunny days when I’m out shooting and still want to get some waterfall shots. I’ve had a number of tripods. I don’t even recall the brand of the first one. 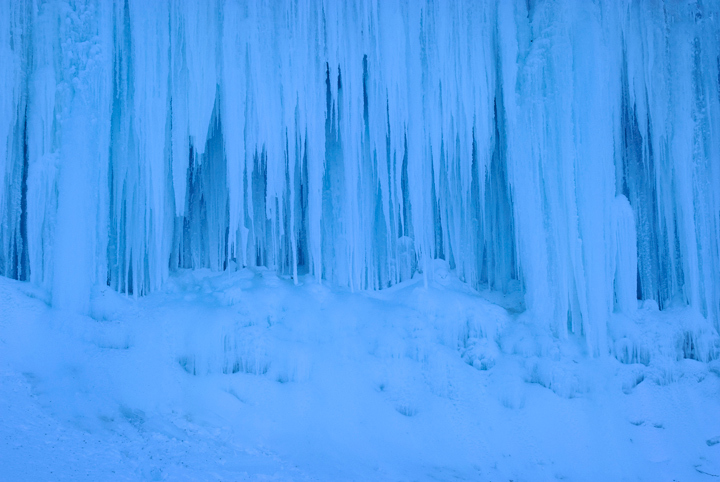 It was cheap and on a -10 degree day at the Apostle Islands Ice Caves it broke. I looked for quite a while and finally decided on the Bogan-Manfrotto 190XB. It worked fairly well but I’m short and it was even short for me. I frequently had to use the center column to shoot. I managed to break a clamp on one of the legs. After I repaired it I noticed that I had also bent the leg slightly. This year I upgraded to the Bogen-Manfrotto Pro Carbon Tripod 055CXPRO3. It is a much taller and heavier tripod. It provides a much more stable shooting platform. In addition, it has a built-in level and the center column pulls up and out to allow for better flower shots. I’ve been using the Markins Q3 Ball head. This is the only ball head I have used so it is difficult to compare it with anything else. It seems to stand up to quite a bit of abuse. It landed in a stream with a sand bottom but after cleaning it up it seems to work fine. One of the things I don’t like about it is when I in portrait mode it only has a single slot to allow the camera to be rotated 90 degrees. I usually also have to rotate the head to shoot portraits. On the other had this comes in handy when I forget to tighten the ball and the camera and lens fall forward. The camera and lens usually fall only about 40 degrees rather than 90 degrees so I’m probably better off with a single slot. I would be happy to answer and question you might have on the equipment I use. My photography can be seen on my website. 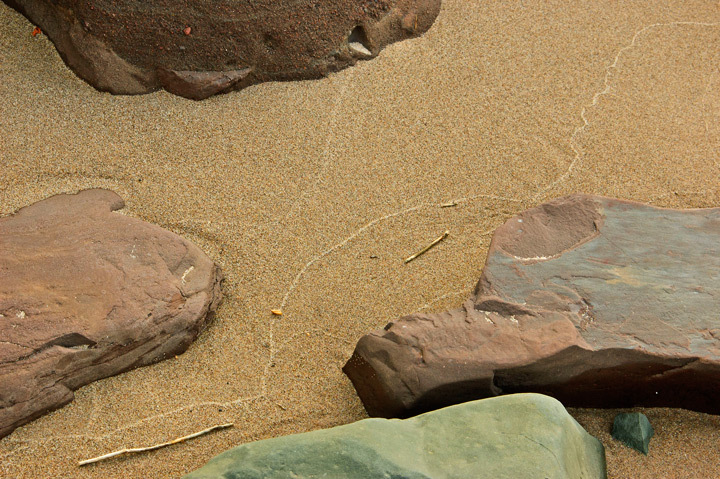 I recently found out that I had two wining photographs in the River Alliance of Wisconsin fourth annual photo contest. The Alliance was looking for “photography representing the diversity of life that thrives in and along our rivers (including people) and the looming threats to this diversity”. There were 5 categories in this years contest: animals, plants, people, landscapes, and threats. Additional information on the River Alliance can be found on their website. The first winning photo was in the Animal category and was of a Cedar Waxwing taken in the summer along the Red Cedar River in Menomonie, Wisconsin. 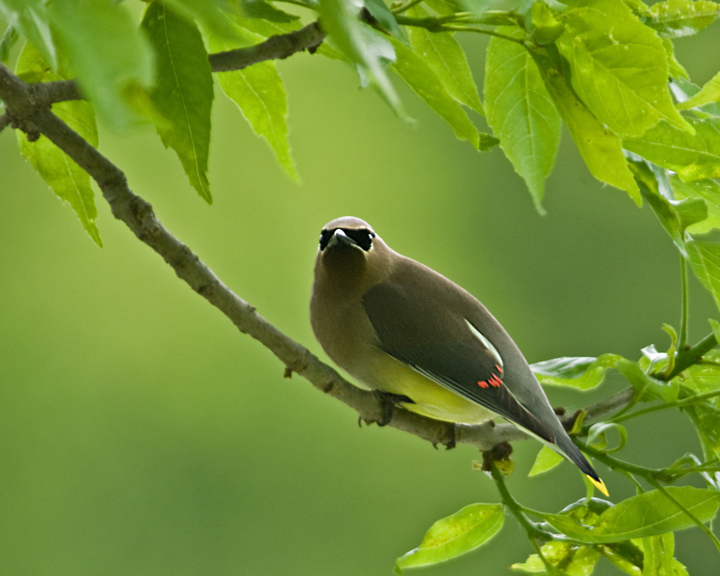 Cedar Waxwings can be found along the trail at various times of the year. You can’t always predict where they will be but when you find one you will find a flock of them. The second Winning photograph was in the plants category and was of a Spotted Touch-me-not. They are the most common flower along the Red Cedar Trail from Menomonie to about the four mile mark on the trail. They usually boom in the late summer. 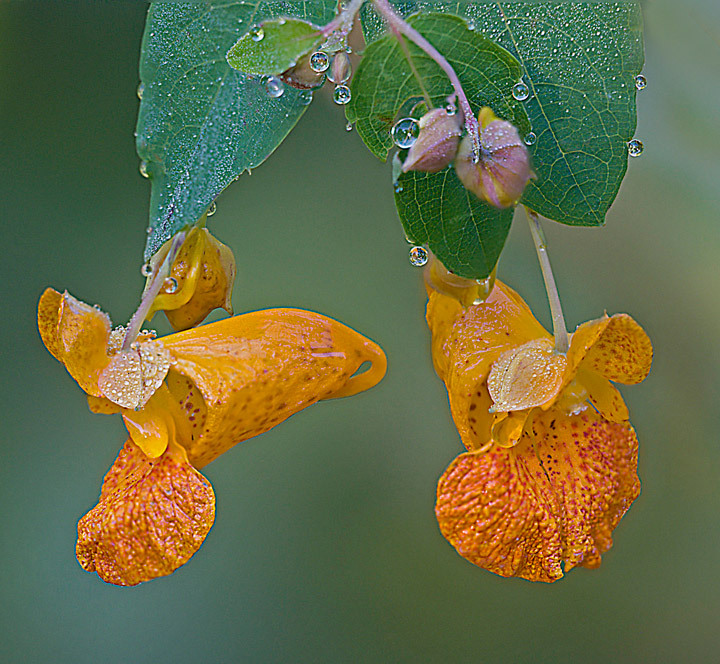 I try to photograph them early in the morning when there is a heavy dew. There are also large numbers of Pale Touch-me-nots in the same area. I’ve also seen a few White Touch-me-nots. You can view all of the photos submitted for the contest by going to the River Alliance of Wisconsin Photo Contest website on Flicker. You must be logged in to Flicker to view the photos. More of my photos can be found on my website. This is the first time I’ve been on the trail since the weekend blizzard. I skied the trail from Menomonie to Irvington today. Someone has run up and down the trail with a snowmobile but it has not been groomed. It is slow going even on classic skis. The surface is very uneven and there are no real tracks. 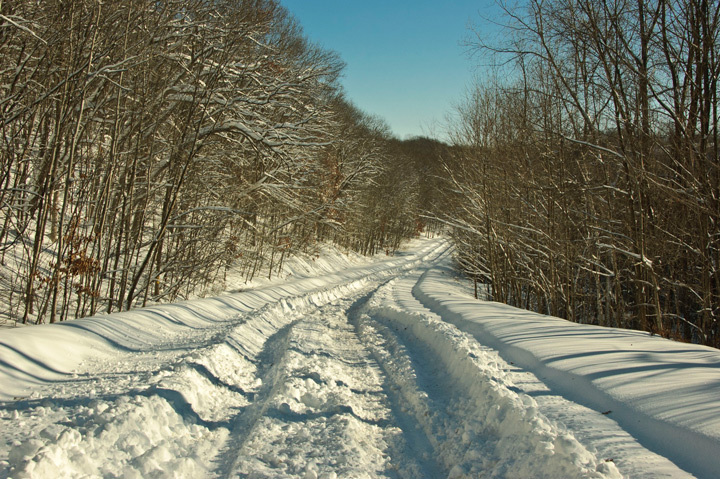 On the other hand if you get off the snowmobile tracks you are breaking trail in snow that is at least a foot deep so it is best to stay on the trail unless you are really looking for some exercise. There has been a lot of frost along the trail on these cold mornings. Even late in the afternoon there was a considerable amount of frost on the trees. It is quite spectacular and well worth braving the cold temperatures. The ice wall at the 1.5 mile mark is looking good. If you ski past in the morning it will have a white appearance. If you wait until the afternoon when it is in the shade it will have a deep blue color. 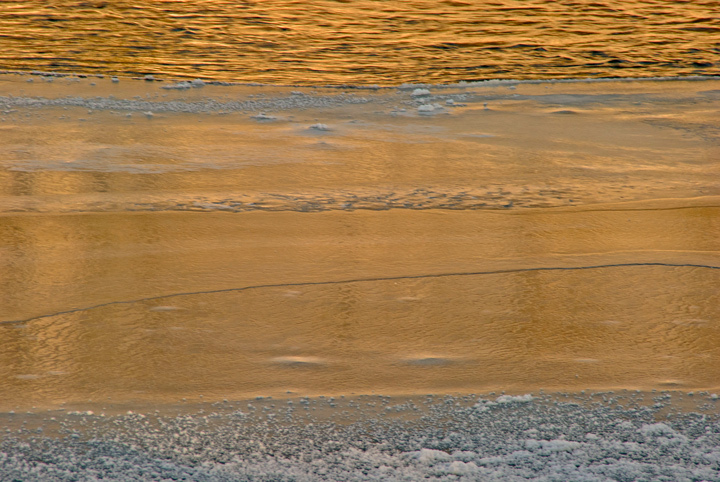 Also in the afternoon there have been some great golden reflections on the river and the river ice. I got some great reflection shots all along the trail. I also saw several deer, two mature eagles and one immature eagle as well as two Red-tailed hawks. This probably falls under the category be careful what you wish for. My wife and I both love the winter so anytime it looks like a storm is coming we start cheering for a real blizzard. Well last weekend we got our wish. Fortunately it occurred on a weekend when we didn’t have to go anyplace. It started late Friday evening and snowed nonstop for almost twenty-four hours. Not only did we have heavy snow but we had strong winds. After the storm was done the weather services said it was one of the top five of all time. 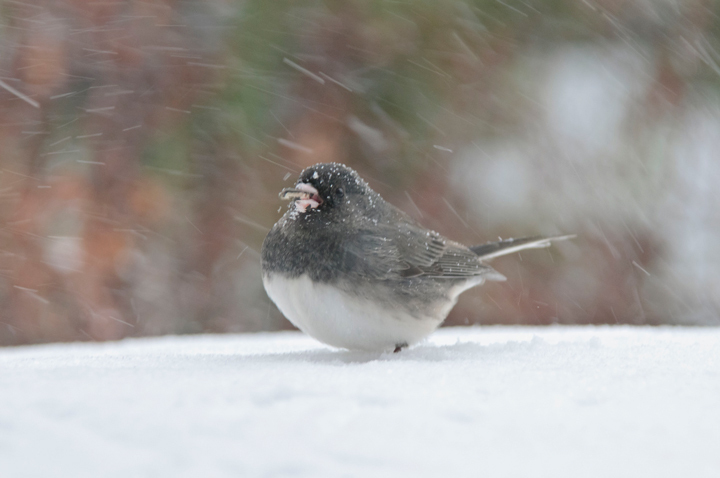 This is a shot of a Black-eyed Junco taken on Saturday morning from my basement window. They were flying from the feeder to a lilac bush next to the house to eat the black sunflower seeds. This was taken before the basement window was completely covered with snow. When I went out on Sunday morning, to feed the birds, the snow was so deep I had trouble getting to the birdfeeder so I could clean off the feeders and put some extra feeders up. This shot was taken after the storm in the middle of the township road that runs in front of the house. It looks like a couple of trucks made a one lane track through the snow. It wasn’t until late Sunday night that the township snowplow made a single pass on the road. I had to put on my snowshoes to make it out to the road to take these photos. The last shot is of my woodpile which I worked so hard on. Fortunately, I had gone out and brought wood into the garage on Friday afternoon before the storm hit. 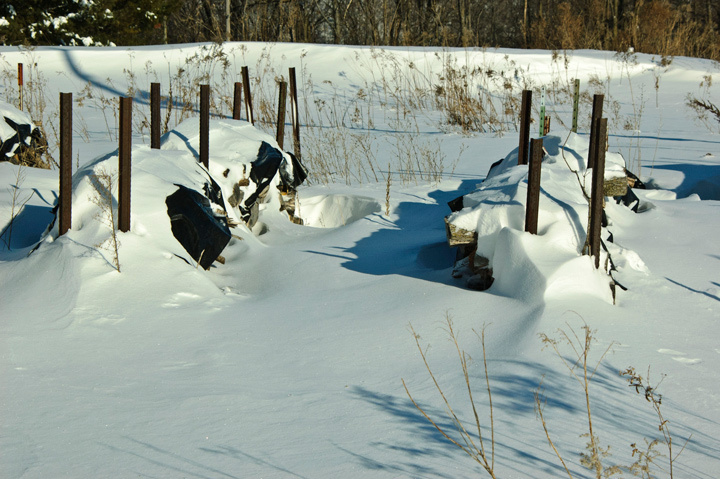 It now looks like it will be quite a while before I can get to the woodpile and when I do it looks like a lot of shoveling will be in order. After a gloomy week, the Packers lost, we had a beautiful day today it was cold and sunny just the type of weather I like. Decided to checkout a number of local photography locations. The first stop was Devils Punchbowl. The Ice is still forming, the small stream was frozen. Not a lot of interesting photo opportunities today. 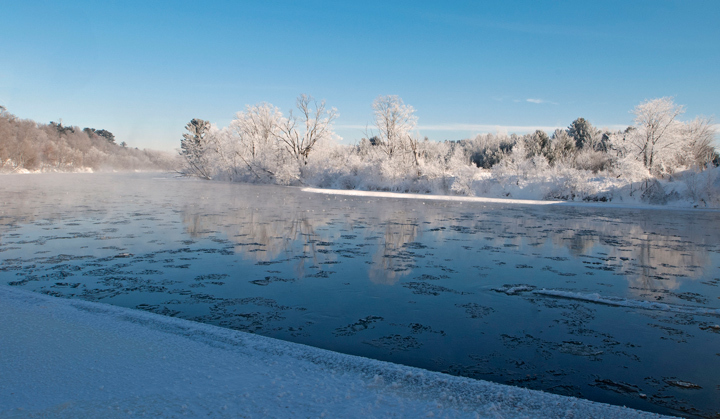 The good news is the ground has frozen and you are no longer required to stand in water and mud to photograph. I did shoot an ice flow on the south wall of the bowl which is show here. Paradise Valley was a little more interesting. 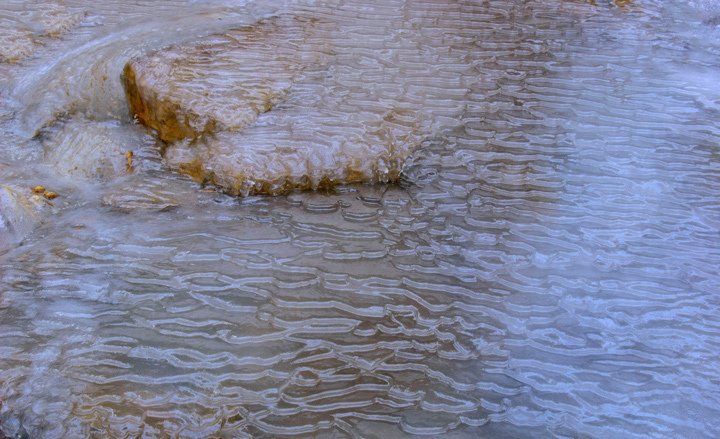 Lots of interesting ice formation along the stream and at the waterfalls. The ice seemed to be a little further along at this location. 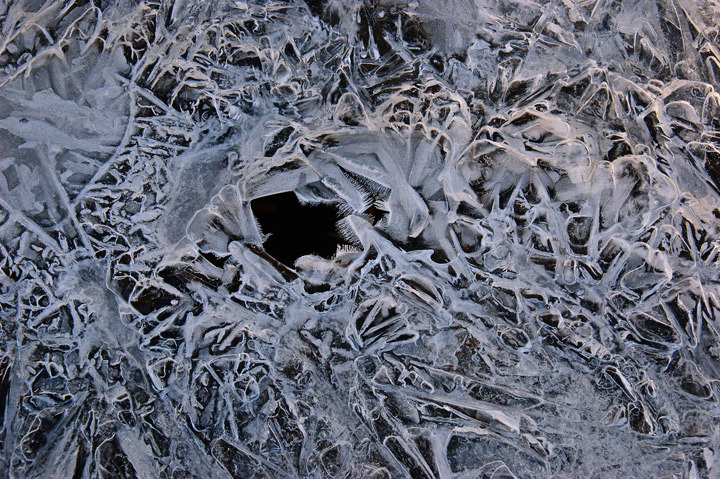 This is a shot of an ice formation just below the road where the stream flows under the road. After walking up Paradise Valley I drove to the Depot at the trailhead for the Red Cedar Trail. I hiked the trail from Menomonie to Irvington. The first thing I noticed was the frost. The trail was covered with freshly fallen ice crystals. 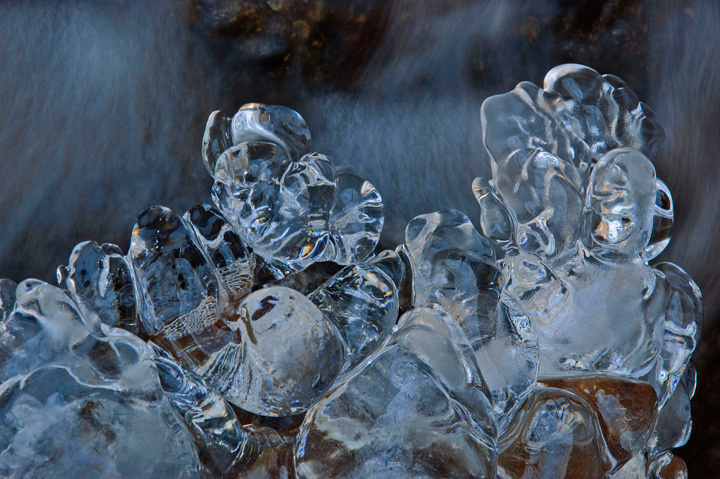 I stopped along several small streams and frozen puddles to take some macro shots of intricate ice formations and ice crystals. There were also some interesting shots in the river where tree branches were dragging in the water and the ice had frozen around the tree branches. The ice wall at the 1.5 mile mark is developing. The ice seems to have quite a bit of dirt in it at this point. I noticed there had been a lot of deer and turkeys on the trail but didn’t see any. There are also a lot of Pileated Woodpeckers around this fall. I saw six of them today but didn’t get any shots. As this shows the Red Cedar Trail is open to all. 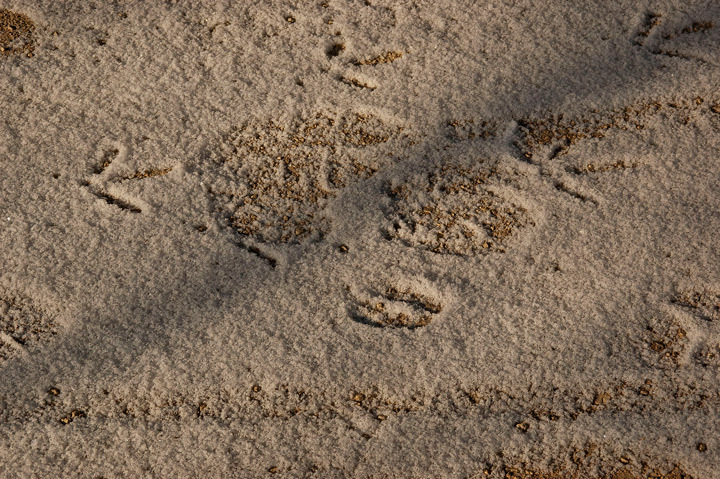 The shot shows tracks from a bike, hiker, deer and turkey. We made a couple of trips to Houghton to pick up our son for Thanksgiving break. On the trip up we stopped at Union Bay on the edge of Porcupine Mountains Wilderness State Park. I manage a few quick photos. This is a shot from the beach at Union Bay. On the return trip after Thanks giving we found that the UP had much more snow. So much that a number of the x-country ski destinations were open. This was a big change from previous years. The locals seem to think they will be having a huge year for snow. Apparently when the lake is warm, as it was this year, they are estimating they will get over 300 inches. 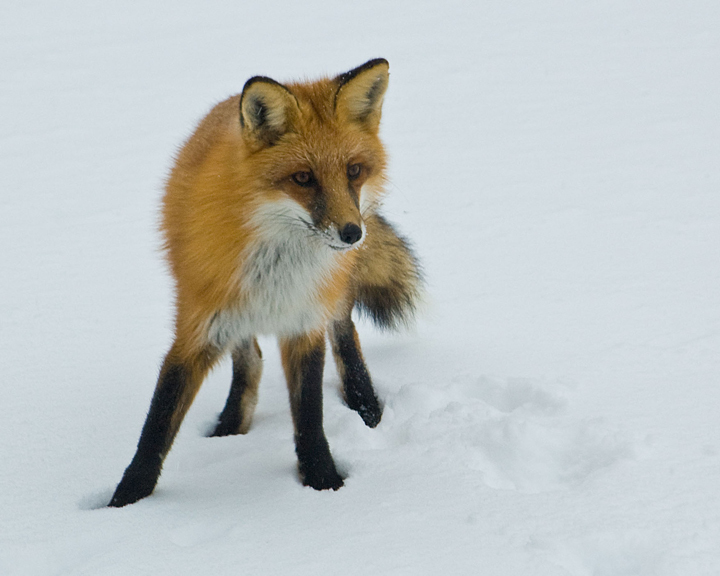 We saw more wildlife than we have ever seen on our drives through the UP. Deer were abundant. We ran across on deer kill with four eagles on it and saw about a dozen eagles in all. Also saw a couple of fox walking across a lake. 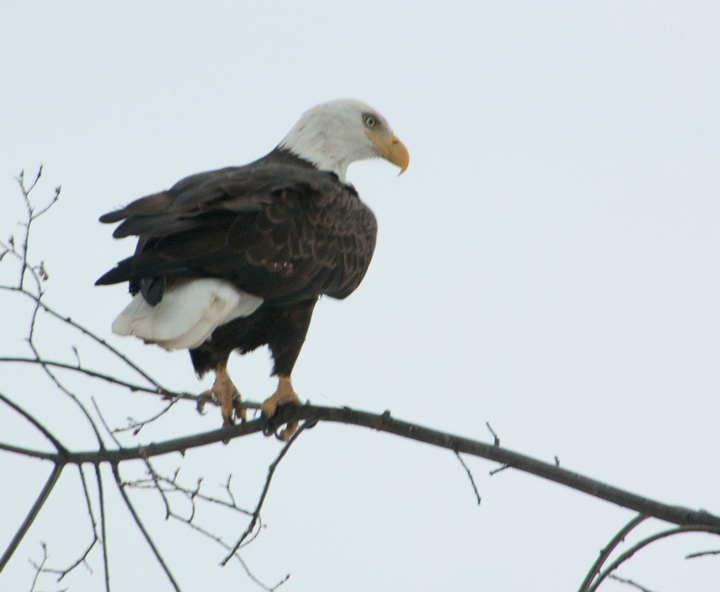 This is a shot of one of the eagles waiting near the deer kill. We stopped along the highway just north of Bruce Crossing to take some photos of a long abandoned farm house. 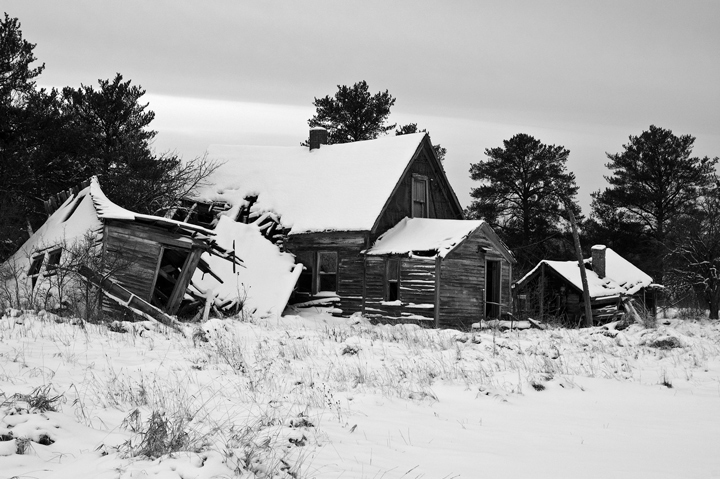 I had been wanting to get a B&W of the place when the snow was on the ground but hadn’t had the opportunity before. The snow is usually so deep that it is difficult to park along the road but it worked out this trip.